On Thursday, October 29th, the children will come in costume, prepared to give a very short oral presentation to the community sharing the name, time period, and contribution of their Ghost from the Past. The younger students are not required to write a report or give an oral presentation but should choose a famous person, come in costume, and be able to say what contribution this person made. ****Parents are invited to attend this elementary event. 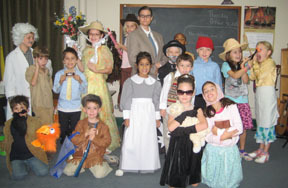 ***** The three elementary classes will gather in the auditorium to introduce their characters. They will visit the Primary classes later in the day. Thursday, October 29 8:45 a.m. – 10:00 a.m. Final draft due by October 28th.